GMVN or the Garhwal Mandal Vikas Nigam has announced the opening dates for Gangotri and Yamunotri for 2012. The two destinations of the Chardham will open for pilgrims from 24th April 2012. Dates for the other two destinations of the famous Chardham Yatra - Badrinath and Kedarnath are still not announced. Yamunotri Weather : Summer-Cool during the dayy and cold at night. Winter - Snow bound. Touching sub-zero. The Garhwal Himalayas have been blessed with some of the holiest Hindu pilgrimage sites and Yamunotri temple is one such. One of the Char Dhams according to Hindu mythology, Yamunotri is the origin of the sacred river Yamuna. Famous for its thermal springs and glaciers, it is one of the most important stopovers on the itinerary of the Hindu pilgrim. According to an old legend, Asit Muni, the revered sage, used to reside here. Perched at an altitude of 3293 meters above sea level, Yamunotri is located in the Uttarkashi district of the northern state of Uttaranchal. It is very close to the Indo-Chinese border and is surrounded by the Himalayan offshoots on all sides. Yamunotri, lies near the Bandarpunch Mountain, which is 6315 m high and lies to the north. The glacial lake of Saptarishi Kund trek, on the Kalind Parbat, at an altitude of 4421 m, is the real source of the Yamuna River. Yamunotri trek is at a distance of 278 km from Dehradun, 236 km from Rishikesh, 176 km from Chamba, and 21 km from Sanya Chatti. It remains cool even during summers. The winters are snow-bound and temperatures fall below 0°C. One is advised to carry light or heavy woolens depending on the time of visit. The first stopover for the Char Dham Yatra is the westernmost shrine of Yamunotri in the Garhwal Himalayas. Dedicated to Goddess Yamuna, it is perched atop a flank of the Bandar Poonchh peak (3165 mts. above sea level) and is situated opposite to Gangotri. The shrine attracts devotees in large numbers from May to October who worship at first Yamunotri and Gangotri is the next stop. Yamunotri is the source of the revered river Yamuna which originates from the Champassar Glacier lying 1 km ahead of the shrine, at an altitude of 4421 mts. Pilgrims do not frequently visit the source of the river as it is not easily accessible. Yamunotri finds a special mention in the Hindu mythology. According to a legend, this secluded hilly spot was the home of an ancient sage, Asit Muni. Among the major attractions of Yamunotri are hot water springs nearby. Devotees prepare rice and potatoes to offer at the shrine, by dipping them in these hot water springs, tied in muslin cloth. The trek to Yamunotri to Gangotri is spectacular, dominated by a panorama of rugged peaks and dense forests. From Rishikesh, a 213 kms. journey by road takes one to Hanumanchatti. From here, the remaining 13 kms. trek is covered on foot or on ponies. Palanquins and Porters are also available on hire. 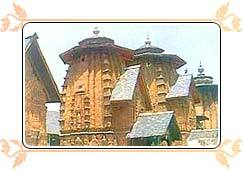 The main temple is dedicated to Goddess Yamuna. The present temple was built by Maharani Guleria of Jaipur in the late nineteenth century. Once destroyed by an earthquake, it has been rebuilt. A holy dip in the nearby tank filled by hot springs and cooking rice in its water are common rituals performed by the devotees. 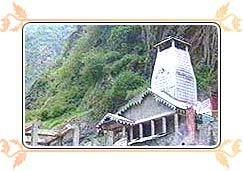 Here you can click lots of Yamunotri photos. One of the important thermal springs known for its very high temperature of 190°F. Pilgrims cook rice and potatoes here to offer to the deity in the temple. A huge rock pillar venerated before entering the Yamunotri Temple. A scenic spot along the banks of river Yamuna that makes a lovely sight enroute the trek upto Yamunotri. A sylvan spot on way to Tehri that offers an excellent view of the Himalayan peaks. Situated at an altitude of 1,676 mts., Chamba is an ideal summer retreat. Rishikesh, 213 kms. & Dehradun, 172 kms.